RV UltraGuard, Tow Guard 94"x16"
Protect your towed vehicle from scratches and road grime with this 3/8" thick cord-reinforced rubber skirt. 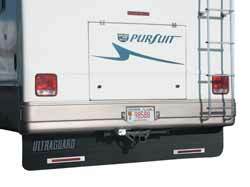 Installs on the bumper or frame of most RVs. 94" wide. Mounting angle bar (92-1796, sold separately) is recommended for the easiest installation. 1 per box.